Until recently, the view was that large-scale enterprise-wide integrated Healthcare solutions would assist NHS organisations to move up the Digital Maturity Index . Healthcare portals are still deemed a key component of this development, however, as budgets are being further constrained, fewer of these major investment projects for Healthcare Exchange solutions are now coming out to tender. Trusts, Local Authorities and CCGs are all looking for innovative ways in which they can better utilise their existing digital assets/ budgets and get more functionality out of their Integration Engines. Recognising this position, NHS England’s Interoperability Handbook , published in September 2015, advocated the use of open technology as a way of increasing the number of suppliers in this market place, and as an alternative to proprietary systems. As this market develops, there is still a lack of solution providers in this Interoperability space, which exists between the top end functionality provided by the enterprise-wide solutions, and, the lower level functionality provided by the Integration Engines within Trusts. In between these two sets of capabilities ReStart has identified a real opportunity for agile solutions to help organisations get more out of their existing systems. We see this opportunity increasing in proportion to the waning of appetite, and budget, for large-scale and complex multi-stakeholder portal decisions. ReStart provides Integration services and support to over 70 Trusts and this is a space we really understand well. With this background we have taken the decision to invest in a presentation and interactive layer solution – Viper360®. The goal is to step into that Interoperability solution gap between enterprise-wide solutions, and the Trust Integration Engine, to give Healthcare providers a building-block approach to Integrated Healthcare. This approach will support a Trust’s aspirations to move up the Digital Maturity Index, starting from a low cost base. With its modular, open-technology approach Viper360 prevents data duplication. By providing real-time access to clinical data, Viper360 is offering concise clinical information at the point of view. The Viper360 vision is built on providing three layers of functionality, each representing greater Digital Maturity to its users. Level 1 is a view-only presentation layer suitable for early adopters of Integrated Healthcare. Level 2 provides an interactive layer with read/write back functionality. Level 3 provides clinical pathways developed for the local Healthcare economy. In South West Yorkshire NHS Foundation Trust Viper360 is delivering a county-wide project to bring historic patient data into one place, and provide real-time access to current and legacy Community, Mental Health and Acute data in a single user-specific view. In Nottinghamshire Healthcare NHS Foundation Trust, Viper360 is being used to link disparate patient administration systems from Mental Health, Psychological Therapy, Community and Primary Care systems. It provides clinicians with full access to patient records, and maximises the opportunity to place a patient on the correct pathway at the earliest opportunity. In Derby Teaching Hospital Viper360, has been deployed as a Business Continuity solution to ensure system-based patient admissions, transfers and discharges could continue to be managed in the event of planned, or unplanned Lorenzo PAS system downtime. In all its applications Viper360 has been adopted to help organisations access current and historic data on patients across different systems, to streamline service provision and to make clinical decision-making safer. In its deployments, ReStart takes a phased approach from proof of concept to full roll out across major multi-site and multi-service providing Trusts. Viper360 projects are also scalable starting from £100k proof of concept (with initial benefits delivered within 6 months) to £500k full-scale deployments, depending upon complexity. Yes, Restart can deliver a portal, but that isn’t all Viper360 does. 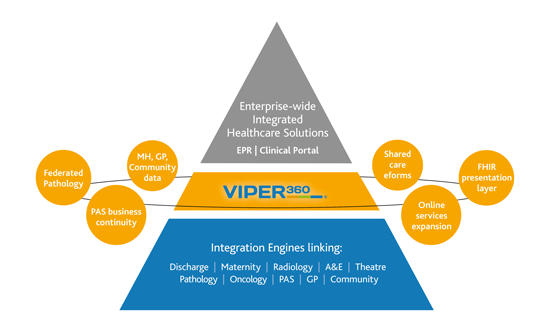 Any system that can be integrated to present clinical information via Viper360 can form the basis of an Integrated Healthcare solution. That makes this solution flexible, speedy to deploy and affordable. The landscape is changing and ReStart offers an innovative solution in this new Interoperability market place.